SANTA CLARA, CA--(Marketwired - Sep 22, 2016) - Hedvig today announced the Hedvig Distributed Storage Platform Version 2.0, a new release of its comprehensive software-defined storage platform that includes features delivering multi-workload, multi-cloud and multi-tier capabilities. This modern, hyperscale storage architecture is the realization of Hedvig's vision for the Universal Data Plane detailed in a separate release today. The Universal Data Plane is a programmable data management tier that overcomes the rigidity of traditional storage and removes bottlenecks to widespread digital IT transformation. The company also announced that BNP Paribas CIB, the investment banking arm of the world's 7th largest bank, has selected Hedvig as a solution to accelerate its multi-site digital platform efforts. "We have been working with Hedvig for nearly two years after conducting a lengthy evaluation of software-defined storage solutions. We like Hedvig because it was the only product that provided the enterprise and multi-site availability features we needed," said Emmanuel Salzard, Director of IV2 Digital Platform at BNP Paribas CIB. "The Hedvig Distributed Storage Platform now underpins our entire software-defined datacenter initiative and we have it deployed in development across four data centers in Europe to help with rapid prototyping in our digital platform. We're excited about the new capabilities in version 2.0 and, most importantly, Hedvig's vision for the Universal Data Plane aligns with BNP Paribas CIB's global platform strategy." Digital technologies have disrupted how companies manage data and all but the smallest businesses will need to roll out new digital services incorporating existing infrastructure, applications and data. To keep pace with digital service requirements, organizations are responding with a hybrid strategy that seamlessly integrates digital services across private and public clouds. While new container and orchestration technologies make application portability among clouds a reality, data portability -- the ability to move data seamlessly among different workloads, clouds and tiers -- remains a challenge. The Hedvig Distributed Storage Platform Version 2.0 solves the data portability problem with enhancements that offer a new, distributed approach to storing, managing and protecting data across a hybrid landscape. Designed from the beginning as a modern, distributed storage platform able to run on any commodity server or in any public cloud, it provides organizations with all the necessary components to implement their own Universal Data Plane that guarantees data locality and service availability across clouds. "Infrastructure SDS is a hardware-agnostic platform. It breaks the dependency on high-priced proprietary ECB storage hardware and lowers acquisition costs by utilizing the industry standard x86 platform of the customer's choice," said Julia Palmer, research director at Gartner in its July report, Hype Cycle for Storage Technologies, 2016. "I&O leaders should look at infrastructure SDS not as another storage product but as an investment in improving storage economics and providing data mobility including cloud integration." Improve usability and provisioning time in multi-workload environments: New capabilities make it even easier to provide application-specific high-availability policies. Organizations can provision these policies directly from their workload management tool of choice with a new VMware vSphere Web Client Plugin, Docker Volume Plugin and Mirantis Fuel Plugin. Hedvig also improved high-availability Hyper-V support with integration into Microsoft's Scale-Out File Server. Streamline efforts to operate multi-cloud clusters: Expanding its support for integration of public clouds, Hedvig demonstrates interoperability of the Hedvig Distributed Storage Platform with AWS, Microsoft Azure and Google Cloud Platform. Integration of Mesos and Kubernetes also provides more cloud orchestration options and new user-defined tagging, multitenancy RBAC, and Ansible-based installer simplify multi-cloud operations. 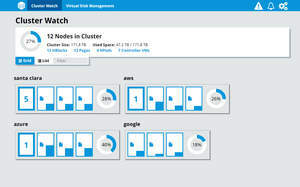 Lower storage costs in multi-tier deployments: Core enhancements that improve Hedvig performance and operations as a multi-tier storage platform include the availability of predictive storage analytics, support for virtualization of third-party storage arrays and cloud volumes, and enhancements to the Hedvig Storage Proxy that improve deduplication and server-side caching. "Traditional storage is monolithic, expensive, deployed as discrete tiers and can't kept pace with modern application-layer innovations. Customers need a better approach to managing their data as their businesses go digital. They seek a single platform that lowers their storage costs and gives them a clear path forward on their journey to the public cloud," said Avinash Lakshman, Hedvig founder and CEO. "Our vision for the Universal Data Plane and the resulting enhancements in Version 2.0 of our software-defined storage platform provide such an approach -- a programmable data management platform that enables organizations to prototype, deploy, move and scale services rapidly."